On March 28, 2011, NASA’s Swift satellite caught a flash of high-energy X-rays pouring in from deep space. Swift is designed to do this, and since its launch in 2004 has seen hundreds of such things, usually caused by stars exploding at the ends of their lives. But this time was hardly “usual”. It didn’t see a star exploding as a supernova, it saw a star literally getting torn apart as it fell too close to a black hole! The event was labeled GRB 110328A –a gamma-ray burst seen in 2011, third month (March) on the 28th day (in other words, last week). Normal gamma-ray bursts are when supermassive stars collapse (or ultra-dense neutron stars merge) to form a black hole. This releases a titanic amount of energy, which can be seen clear across the Universe. And those last two characteristics are certainly true of GRB 110328A; it’s nearly four billion light years away*, and the ferocity of its final moments is not to be underestimated: it peaked at a solid one trillion times the Sun’s brightness! Yegads. I’m rather glad this happened so far away. That’s not the kind of thing I’d like to see up close. Although initially cataloged as a GRB, followup observations indicated this was no usual event. The way the light grew and faded seemed to fit better with a star getting torn apart. And what can do that to an entire star? A black hole. So instead of the star in question forming a black hole, it apparently literally fell victim to one! The observations indicate the black hole in question may have as much as half a million times the mass of the Sun, meaning it’s very probably a supermassive black hole in the very center of a distant galaxy. Hubble Space Telescope observations (not yet released to the public) also place the event very near the center of a galaxy, which is consistent with this scenario. So what happened? We think that at the center of every large galaxy (including our own Milky Way) lies a supermassive black hole, some with millions or even billions of times the Sun’s mass. Some of these, like our own, are sitting there quietly. Without matter falling into them, black holes are pretty calm. But if a gas cloud, say, wanders too close, it forms a disk around the hole called an accretion disk. This disk heats up and can emit tremendous amounts of light (as in this illustration here). Some galaxies are continuously feeding of material like this, and we call them active galaxies. In the case of GRB 110328A, something else happened. The galaxy is known to be quiet; NASA’s Fermi satellite can see gamma rays over much of the sky, and has reported no emission from this galaxy for the past couple of years. So whatever happened here was a singular event. 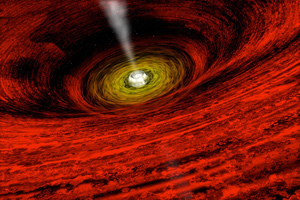 What fits all the data is that of a star orbiting the center of the black hole. Perhaps it was on a safe orbit but got flung closer to the black hole after a close encounter with another star or gas cloud, or perhaps it started out close and over millions of years its orbit has brought it closer and closer to that monster at the galaxy’s heart. 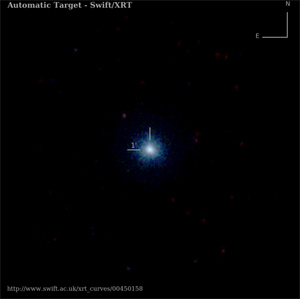 Swift X-ray image of GRB 110328A – a 41 hour exposure! Whatever happened, the star’s life ended suddenly and catastrophically. Black holes have incredibly strong gravity, of course, but that gravity gets weaker with distance. Stars are big, a million or more kilometers across, and that means one side of the star was substantially closer to the black hole than the other, so the near side felt a stronger pull of gravity than the far side of the star. This has the effect of stretching the star in a process called tides. A star is held together by its own gravity. As the star in question here inched closer to the black hole, the force stretching the star got stronger, and at some point overcame its internal gravity. The star got literally torn apart by the black hole! The material swirled around the black hole, forming a small and temporary accretion disk. Observations indicate that for a short time, two beams of matter and energy called jets erupted from the doomed star the black hole, and it was the flash of tremendous energy from this that triggered Swift, and a flurry of observations from other telescopes cascaded from that. It’s not certain that this is actually what happened so far away in the core of that far-flung galaxy, but it does fit what’s seen so far (and at least one other star has been seen to have been eaten by a black hole before). It also predicts that radio emission from the event will be highly variable, and that the visible brightness should brighten again over the next few weeks. Astronomers are eagerly observing this distant event to see if their ideas will still hold true as time goes on, or if more surprises are in store. And I need to add something to this story. I used to work on Fermi and Swift, writing educational stories and activities based on their observations, but that was many years ago. I don’t keep up with their daily doings so much. I actually found out about GRB 110328A when I got an email the other day from my friend Adria Updike, who observes GRBs. She told me an amazing thing: a colleague of hers, PhD candidate Alexander Kann, started a thread on the Bad Astronomy/Universe Today Bulletin Board about the GRB. BAUT, as we call the board, was started by my friend Fraser Cain of Universe Today and myself, hence the name of the board. On the left is his observation on April 1, and on the right on April 4. The position of GRB 110328A is circled. As you can see, it was pretty faint. It has apparently faded somewhat over the three day interval – which is expected; the initial event (a star getting torn apart! I can’t get over that!) released a huge flash of energy which faded over time. It’s hard to see in the two images because the burst looks about the same brightness, but the second observation had a longer exposure time (you can see fainter stars in it), so the source did fade. This GCN resulted from a collaboration initiated by the BAUTforum. Note the credit they give to BAUT. Awesome. Never underestimate the power of social media, especially in the sciences. You never know how far they reach… and in this case, that reach was 3.872 billion light years. * Or, to be pedantic, it took nearly four billion years for the light from the explosion to get here.